House Speaker Nancy Pelosi swears in members on Thursday at the Capitol, including a record number of women in the House of Representatives. On the one hand, there are 15 percent more women in this Congress than there were last session. 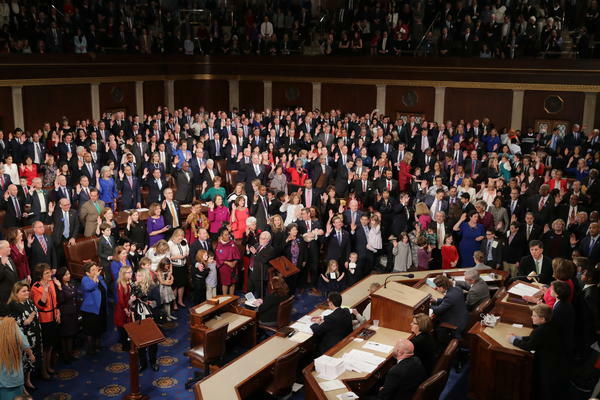 There are now a record number of women of color in the House. There are also a slew of firsts: Congress will get its first Native American women, Muslim women and youngest female member ever. 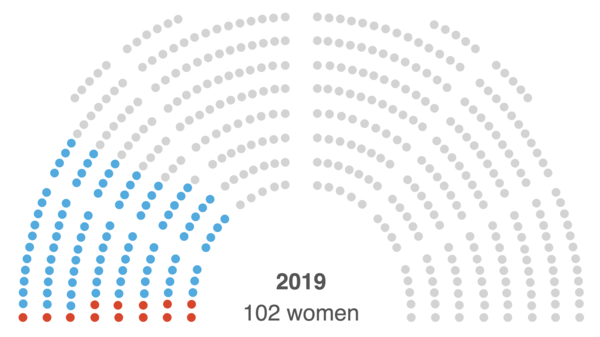 On the other hand, this year's record-setting number of women will bring the share of women Congress members up from 20.6 percent ... to 23.7 percent. Overwhelmingly, these women are in the House. 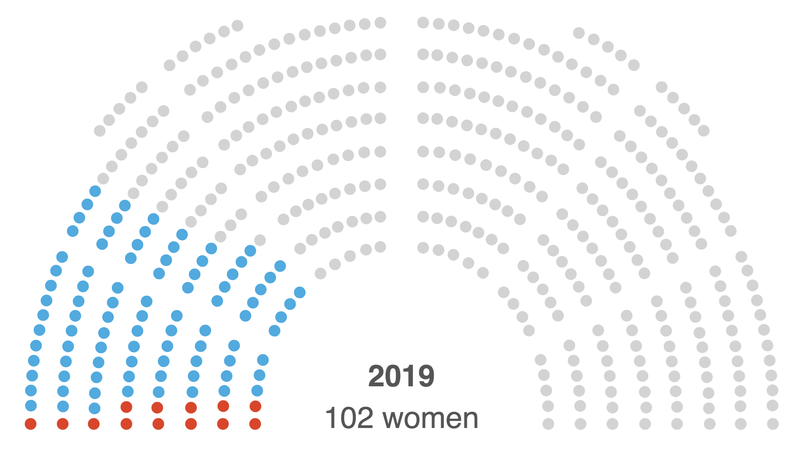 While the number of Senate women will increase by two, the number of House women will grow by 15 compared with those elected in the last Congress. Here's a series of charts to help you understand exactly how big a deal that change in the House is and what it might mean for how the new Congress does its job. A defining feature of the record-setting wave of women coming into Congress is that it is nearly entirely Democratic. While there are 35 Democratic women freshmen in the House, there will be only one on the Republican side: Carol Miller of West Virginia. Altogether, the number of Democratic women in the House will increase by 25 this year, while the number of Republican women will decline by 10. Two (interrelated) things happened in 2018: Voters elected a blue wave, and that blue wave had a lot of women in it. Starting in January 2017, it was abundantly clear that Democratic women were furious that Donald Trump had been elected president. That helped push a record number of Democratic women to run for office. That led to a record number of Democratic women nominees and ultimately a record-setting freshman class of them. About 30 percent of Republican men who left their seats (either through retirement, resignation or defeat) have been replaced by Democratic women. And almost half of Republican women who have departed were replaced by Democratic women. So now, as the new Congress starts, there are only 13 Republican women in this House, down from 23 last session. There are a lot of reasons for this. There are relatively few Republican women in state legislatures, for example, and a lower share of women are Republicans than Democrats. But there's also a sense within the party that they may need to adopt different policies. Former Rep. Mia Love, R-Utah, expounded upon the need for more contraceptive availability as an example at a December panel hosted by Politico. "I mean seriously, I am pro-life. I'm unapologetically pro-life. Why not give women the option of having their choices when it comes to health care before they have to choose between keeping a life and ending a life?" she said. "And the fact that I've got more issues with Republican men on this is absolutely absurd to me." Aside from that, when it comes to promoting female candidates, Republicans lack a massive outside spending machine like Democrats have in Emily's List. In addition, the Republicans' House fundraising arm, the National Republican Congressional Committee, doesn't participate in primaries, as the Democratic Congressional Campaign Committee does. Some in the GOP, like New York Rep. Elise Stefanik, believe that boosting women in primaries is essential to ultimately boost GOP women's congressional numbers. That's why, in December, Stefanik said she was stepping down from her recruitment post at the NRCC — to focus on using her own leadership PAC to help women in her party win. There's a conventional wisdom in Washington that women are more bipartisan than men — that once they're in Congress, they will be more willing to make compromise legislation. There's anecdotal evidence of this. Women were instrumental in ending the 2013 shutdown. Women like Maine Republican Sen. Susan Collins and Alaska Republican Sen. Lisa Murkowski have a reputation for being open to crossing party lines on key votes. It's a particularly seductive idea at a time when partisan rancor in Washington seems to regularly hit ever-new highs. But it's not necessarily true, according to recent research (and as NPR reported last summer). A late 2018 study found that while women on the Hill are more sociable, in the sense that they participate more in interparty congressional events like Secret Santas, those lawmakers remain first and foremost partisan when it comes to their votes, amendments and even official travel. Across those measures, there are virtually no gaps between women and men. Step back from the data, and this conclusion looks pretty logical. After all, the number of women in Congress has been increasing slowly over the past couple of decades, a time when polarization has also increased. In addition, women in the minority party have been shown to keep their bills alive longer than men in the minority do. All of which is to say that the bills on Congress' docket next year may well look different than usual. As for lawmakers' willingness to compromise on those bills? Don't count on it.